instruments alone: documenting blind pilot's west coast bike tour: Do we need David Attenborough to narrate this documentary? Do we need David Attenborough to narrate this documentary? 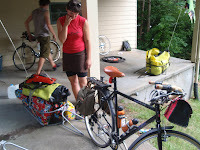 After more last minute bike preparations, including fixing Kati's brakes and putting the finishing decorating touches on Luke's trailer, the intrepid quartet headed off to their first stop on the bike tour in Anacortes, WA. We had a vague sense of their route that they would take for the day, and kept doubling back to try to catch good shots of them as they rode their first 40 miles of their journey. Ryan later joked that he expected Max to be hiding in the bushes wearing full camo gear, or up against a red building, wearing all red. We did lose them for a few miles, when we diverted ourselves onto a parallel road to route. Purchasing a copy of their bicycle route map is on the to do list. There was no planned show in Anacortes, so the band members began asking at the restaurants and venues along the main route in town if they would let them play. 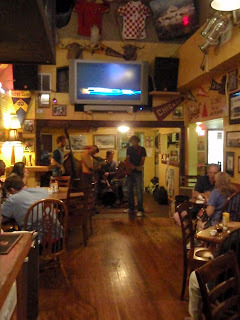 After some persistance and encouraging the bar manager to check out their songs (Israel gave him an iPod, but he found them on Myspace), it was agreed that they could play a set that night at the Brown Lantern Ale House. Although they were competing with a plasma TV playing the Olympics coverage of men's gymnastics, the dinner crowd quickly ended their conversations and began paying attention to the music. Somehow, their energy level seemed even higher than the night before, despite having spent the better part of the afternoon riding bikes. Around 10pm, Max and Emily headed to the nearby Washington Park to set up a large tarp to ward off the forecasts of hail and get Buzz settled in for the night after her evening spent patiently sitting in the car. Despite some noisy neighbors and drama that apparently goes with camping overnight in a city owned park, it was nice to set up camp and feel satisfied with competing a full day of tracking, filming at a venue and successfully finding a place to sleep. Only 59 days to go.